Discussion in 'The War Room' started by Gabkicks, Jul 27, 2016. Trump in a roundabout way hinted at Russia to 'hack' and get those 30,000 deleted emails. Surely, Trump campaigns over, right? Wrong. Because how could it be espionage/encouraging Russia to get USA's secrets if Clinton's email server only had "personal emails"? Clinton always claimed those deleted emails were personal emails... not USA secrets. They just took the bait... and Trump is about to eat them alive. This is why he is winning folks, and this is why his IQ is 156+. iloveufc123, irish_thug, Arkain2K and 19 others like this. I don;t know that he said it purposely like that but I made the same point in another thread. Hillary claimed that the emails had personal info on them. If it is discovered that she lied she should be behind bars. waiguoren, LilMountain, Adamant and 8 others like this. During the Democratic convention nonetheless. All the TVs in the hallways and lobbies at the DNC all of a sudden have Trump speaking on them. Warlord Palis, waiguoren, IronMan374 and 4 others like this. didn't he allege putin said the 'n-word', too? BKMMAFAN, Dayman1984 and J. Bernie Cunningham like this. Trump's been playing chess since he started. 1. Make crazy but ambiguous statement that creates controversy and gets media coverage. 2. Poll numbers tank, people say this was a mistake. 3. Explains himself and shows how the media is dishonest. LuchaBear, riddleofsteel, spamking and 2 others like this. VivaRevolution and Brampton_Boy like this. Warlord Palis, IronMan374, Malvo and 1 other person like this. 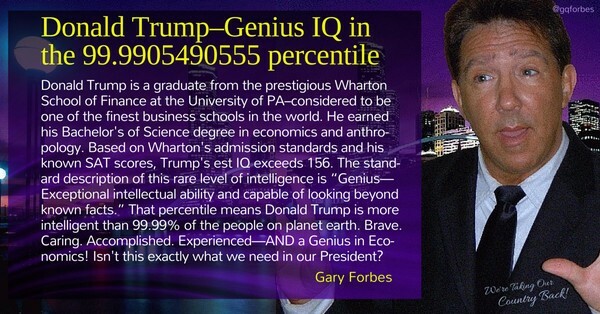 If his IQ is 156, why did he transfer in to Wharton from an average school. Why didn't he graduate with honors? Hillary was Valedictorian at Wellesley and graduated with honors from Yale. OverPressure, WalkenWouldOwn, raty tat tat and 1 other person like this. The IQ is based on his SAT scores, see the post above. LuchaBear, HeLLMuTT, SleepyBoy and 3 others like this. She says many times it was a personal email server. The FBI guy says different. fmartnz2, Adamant, riddleofsteel and 4 others like this. Jin Akutsu, IronMan374, SleepyBoy and 1 other person like this. Er, it's still espionage either way. You think Trump will actually show up to a debate? Oh he is clever I know that, I saw the video when it aired. He is great at manipulating the media. I'll say it again. I think HIllary is in trouble. irish_thug, Adamant, HeLLMuTT and 2 others like this.